So, apparently, Gundam Versus’ staggered release last year was a one time deal. 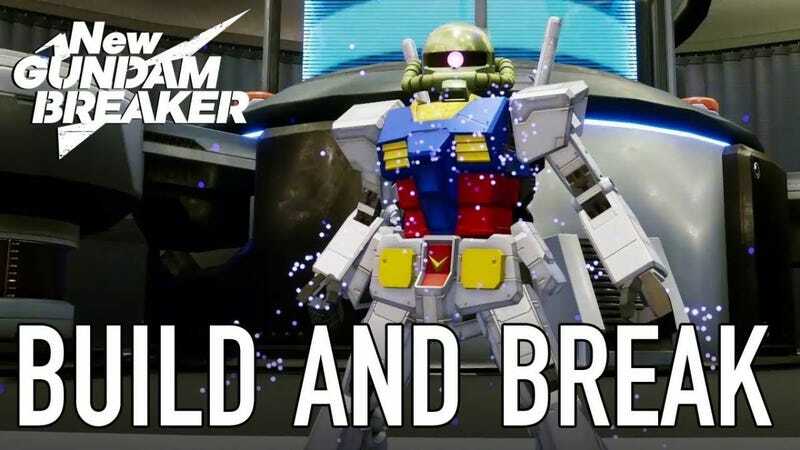 The next game on the Gundam docket, New Gundam Breaker aka Gundam Breaker 4, is set to release June 21st in Japan and June 22nd everywhere else. Forget a gap of 3 to 4 months, they shortened it to a day. That’s pretty neat. To put things into perspective, the last major Gundam game to see a western release prior to last years Gundam Versus(Not counting the Dynasty Warriors Gundam games or the Vita game Extreme Vs. Force) was 2006's Gundam Crossfire, a PS3 launch title. The game was extremely buggy and graphically muddy and as a result was given mediocre reviews. This backlash prompted Bandai Namco to throw a tantrum and cease releasing all future Gundam games in the West, save the Dynasty Warriors Gundam series. This denied us the infinitely better sequel Gundam 0081: Battlefield Record, the Gundam Unicorn game developed by From Software, MS Side Stories: Missing Link which contained remakes of many past Gundam titles, Gundam: Battle Operation(Basically Battlefield: Gundam), Battle Operation NEXT(Battlefield: Gundam but with more hero units to the point where most matches boiled down to Gundam vs. Gundam), the Extreme Vs. series of fighting games(Except Force for some reason. ), and of course the first three Gundam Breaker titles. New Gundam Breaker will reportedly release with a “Build G Sound Edition.” For those not familiar, the G Sound releases of Gundam games typically contain a lot more music from the original television series and movies. These releases are most common with the Gundam Vs. series. However, until now, they’ve never been released outside of Japan. As far as the source article is concerned, the Build G Sound Edition will contain music from the Gundam Build Fighters series(A series revolving around gundam plastic models coming to life and battling it out for supremacy... so Gundam Breaker in TV form essentially.) and past Gundam Breaker titles, and see a western release(Not specified so partly speculation on my part. ), a first for a G Sound Edition. I admit, this is all quite unexpected of Bandai Namco, but it shows they’re serious about bringing Gundam back to the west and I couldn’t be any happier. Having said that, I’m still waiting on the announcement that Gundam Battle Operation 2 will be also be heading west, preferably this year and at the same time as the Japanese release. That may be wishful thinking however. While Bandai Namco may have brought over Gundam Versus and now New Gundam Breaker, Battle Operation 2 is likely to be a bit... controversial. See, the original Battle Operation, and I’m assuming Battle Operation NEXT, heavily featured microtransactions. While the game itself was fun, it was difficult to play due to the player only getting three play tokens for free, and each token regenerated over the course of three hours. In other words, you could only play once every three hours once you used up your initial tokens. If you wanted to play continuously, you had to buy more tokens, sort of like playing an arcade game. But the microtransactions didn’t stop there. Using real money, you could buy better mobile suits and equipment. You could unlock all of this through gameplay, but why do that when you could just spend your way up the ranks? It was quite annoying, especially for a foreign player like me who couldn’t speak to anybody(and technically shouldn’t have even been playing the game in the first place. ), had a horrible connection to everyone else, and couldn’t spend any money on the game because it probably wouldn’t take my American debit card(Which I didn’t even have at the time so the point is moot.). If I had wanted to spend real money on the game(And I wouldn’t have, just an FYI. I hate microtransactions outside of cosmetics. ), I would have had to purchase Japanese PSN cards from a site like Play-Asia.